Drone Records has been established in 1993 – at that time I was very active in the international cassette network exchange movement and we were also active there with Maeror Tri (releasing MCs on various labels around the world), so I grew up in this scene. We started to think about releasing cassettes and vinyls and we wanted to do a 7″ vinyl for Maeror Tri first, and with this idea it all began, with this Maeror Tri 7″ and with blank covers which we spraypainted. It was so nice that I decided to continue the label, not only using it for our own stuff but also for bands I liked from the international experimental scene. So you immediately turned towards the international scene? You didn’t wish to focus at first on the German market, or the people living around you in Leer? Oh no, at first perhaps I thought about doing this only for German bands, but it felt stupid because I had so many international contacts already. It all came through the cassette scene which at that time was very popular, and also through Maeror Tri in the late 80s. The local scenes were always too small for this kind of ‘difficult’ music. When did you find yourself being attracted to experimental, industrial and drone music? When I was about 15 I was into independent alternative music; I’d already started when I was 13 or 14 and it went further and further into more extreme stuff. I think the first real experimental record I had was Psychic TV when they were really experimental (Berlin Atonal) – then I got to know some people like for example Helge Siehl and together we formed Maeror Tri later on (the former band of M.T., Screaming Corpses, was founded in 1986 – I’ll check the archives to find a photo). There were some likeminded people in our small town we could exchange some music with, so we did. We were looking for something special and were unhappy about the situation in our lives and also with the music, so we were all looking for extremes. What we did first was very aggressive, but later on it turned into some kind of ‘yearning for something more profound’ than the daily reality, something more fantastic, mysterious, but also utopian. 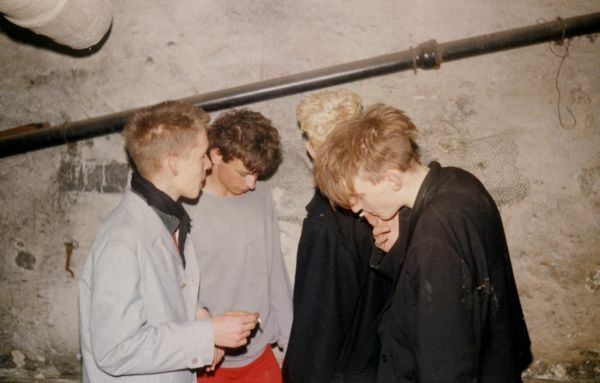 At the time there weren’t so many industrial bands and the drone or dark ambient genre didn’t really exist, just this experimental/ industrial type of stuff; mainly British bands, but it was perhaps easier to follow all this. There was no Internet where you could just check and learn about the bands, we had to go to record stores in other towns and look after it, or order some stuff by mailorder. Visiting festivals was usually too far away and too expensive. 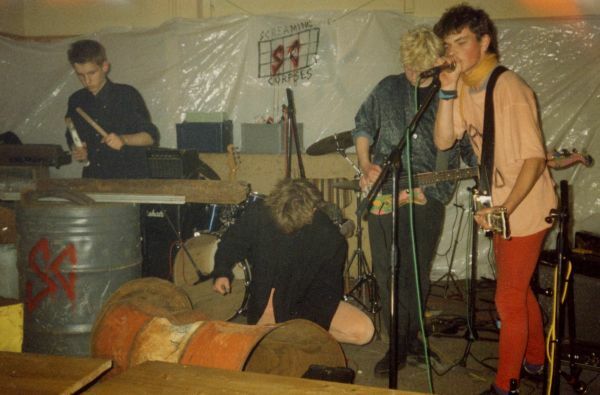 But I remember one club in Wilhelmshaven (Kling Klang): we saw Controlled Bleeding and Bourbonese Qualk there, also Legendary Pink Dots – they were strange enough at the time so we liked it. So that was a really great experience there. Was this your dream when you were younger, to have your own record label, or did it just happen because it was practical ? My dream when I was young was to have a real record shop! That was my biggest dream. 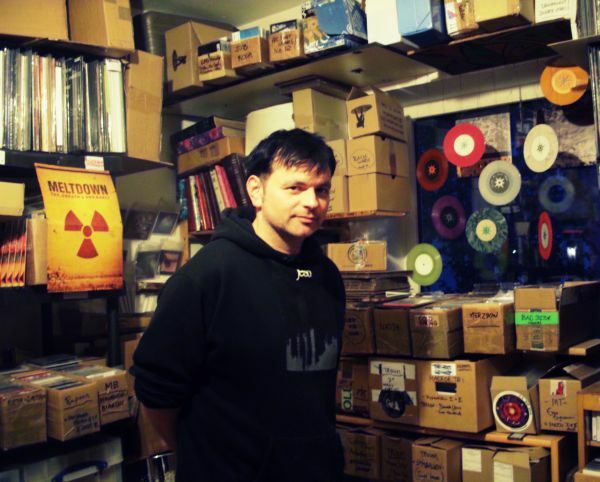 When I was like 15 or 16, already at school, I said: ‘I’ll have a record shop in London later’. But after school I realized that owning a record shop for this kind of music is impossible; it’s too expensive to pay the monthly rent and you simply can’t sell enough music from this type of genre. So I had a typical business education in Germany first (‘Industriekaufmann’, a kind of industrial clerk) but at the same time we were very active with Maeror Tri and some small labels were too. This DIY idea behind it was very alive; many people were running their own little cassette labels. 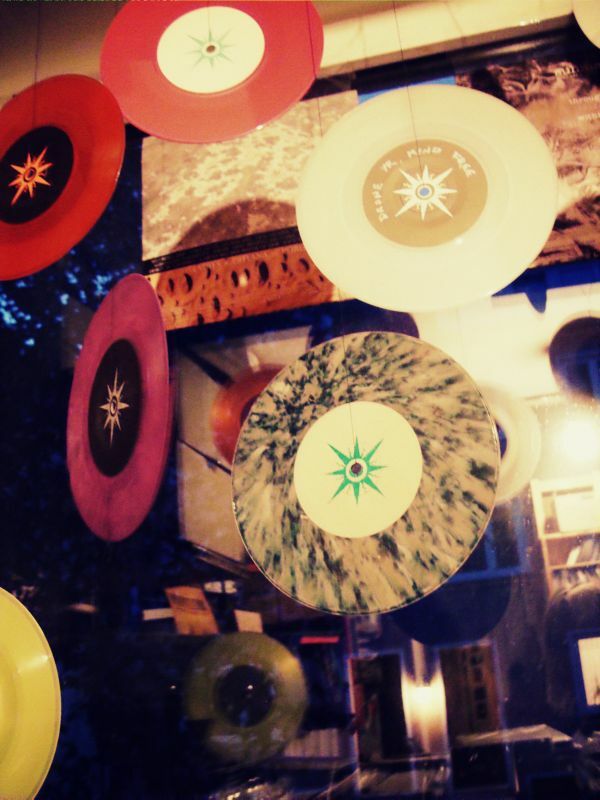 At first I also wanted to go that way, releasing tapes, but then I thought: why not do 7″ vinyls? Why did you choose this format, was vinyl more attractive to you at the time? Besides the format being attractive to me personally, there was a kind of fight going on between vinyl and CDs. The CD was just appearing in the early 90s. It was very highly priced and the CD industry was trying to completely destroy the vinyl market; they said that only the CD should stay on the market. There were some people, especially from the independent scene, who wanted to fight against this. At that time vinyl was a kind of sign that you belong to the opposite, the alternative side. CDs were also very expensive, in Germany you had to pay something like 36 DM for one CD (around € 18.50 today, increased by the inflation). Noone wanted to pay that much and vinyls (LPs) were still like 15–20 DM. The CD industry really used their power and money to protect the CD market. Going back to the label – was it easy to get the bands on board, or were there some fights between the labels? No, never. I maintained contact with some bands through Maeror Tri, the ones we played together with or did exchanges with. None of the bands were really famous, often they only existed for 2 or 3 years. Besides that I also did a review corner for cassette releases in a DIY magazine, it was called “Barackes Tape Ecke”. I also made a series there about German underground cassette labels, and so I learned all about the labels and bands etc. When did the label become your daily job and you decided to stop other professional activities to make a living just from that ? 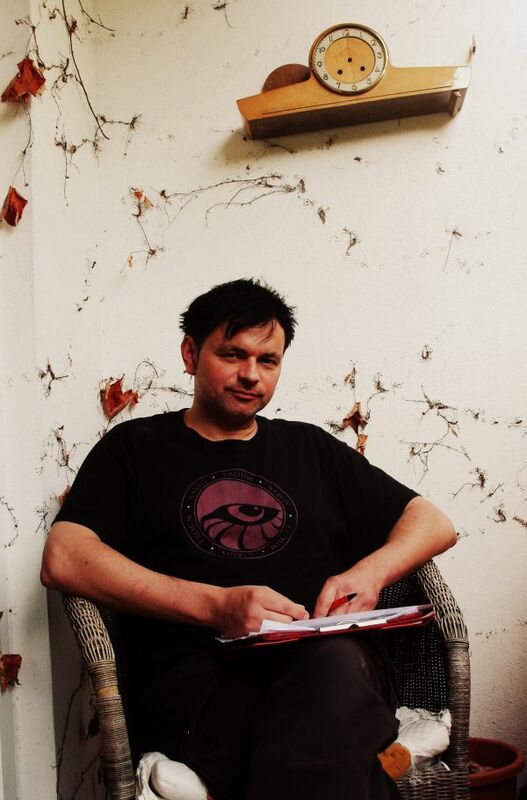 That took a long time, I started in 1993 and I was working in Bremen until 1996 (a normal day job in a computer/ network firm) and then I studied for like 8 years, and through all these years I ran the label, I started the mailorder, I made music, etc. After finishing my studies I decided to try and live from this. I couldn’t live just from the label, it’s always a combination of label, mailorder and the band (Troum) altogether. It’s always good to have nice releases to do exchanges with. But to make a living from it, it took at least 10 years to make that possible. Did moving to Bremen help you improve your life ? Yes, because we come from a very small town and it pisses you off to live there when you grow up. There were only a few people who had similar interests and Bremen is much bigger, a lot of more is happening here, while it’s still not a very big city. 10 years ago there was a better scene here but then again people moved to bigger cities like Berlin, Hamburg, etc… I think it happens in every European country that creative people mostly choose capitals. Moving here was a kind of natural step to take, due to professional reasons and other friends already living here. Bremen is also not that far from our homeland. The band factor was important as well; Helge and me, we moved first, while Martin was coming over during weekends to rehearse. If some of us had moved to Berlin this would have been impossible. Does the fact that you are a psychologist help you in running the label? Well, I was fascinated with brain research and then I started my studies. There was this wish inside me to explore the ‘deeper self’ and the Unconscious, so in the end my studies didn’t really help me to run a label or business, but it helped me find out what kind of music I like and why, and maybe who I am. I thought about working on my occupation field, for example to work as a music therapist, but you need to do a second education level for that, and learn to play certain instruments perfectly, and that’s a lot of work…. I wanted to organize things myself and not be dependent from some institution again. What is the hardest part of running a label? Is it the packing? How it is with listening to demos – are you overwhelmed by homemade music demos ? Yes of course I’m getting lots of demos, especially via e-mail. It’s almost impossible to listen to everything but I try, because I’m also very curious. In the early days I received only cassettes, then it turned to CDRs and now it’s mainly via email. Did you discover some band this way? I mean bands who got famous after their appearance on your label? There were definitely some examples; in the very early times of the 7″ series I released bands like Inade or Contrastate, Bad Sector or Voice Of Eye, Aidan Baker… they all got quite well known afterwards. Although I’m not completely sure anymore if they sent demos, or how we got in contact. Tell us about the idea of a 7″ series. I always liked 7 ” and I collected this format myself because it’s the perfect format to have a short entry into a new musical world. Especially for experimental music this can be nice, because it’s not so expensive and with those 10-15 min of tension you can have a completely new experience. Also this idea of a small and sweet format was very close to me. I have the impression that the amount of released 7″ becomes less and less, 20 years ago there were more around. Nowadays, especially in the dark ambient scene, one usually wants to make a CD. Bands make those very long 20 minute tracks and so you can’t put that on 7 inches. Of which releases are you most proud of? It’s difficult to say, because they all had these handmade covers so they were all special. But some of them were really elaborate, surprising.. The idea was that the bands made the covers themselves. So I sent them the covers (pure black or white ones) and the bands could do something with it. Some left the cover almost just as it was or changed it minimally, some did really amazing work that must have needed many many hours. I have to mention number 23 which was by Noise–Maker’s Fifes from Brussels – they made a nice cover from jute! Number 50 was by Multer – they used a heavy 7″sized metal plate and they brought them all from Dortmund by a car because those 250 copies were so heavy, it was like 100 kg or so! So they brought all those ‘covers’ by car to my place. Møhr used wax and Feine Trinkers Bei Pinkels Daheim a real stone which he glued to the cover! Number 100 by Spiracle was also very nice – they made of kind of cotton wool thing, completely handmade – it was really special and amazing. I also have to mention Big City Orchestra (one side of the cover was painted by kids from a Kindergarten), Cisfinitum (crazy wool cover too) and Voice Of Eye, which musically might be my all time fave on Drone Records. I was very happy to see those extremely special covers, all this was very personal in a way. Today with those programs you don’t even buy a ‘download’ anymore but a ‘streaming’ instead, so if you pay something like 10 dollars you can just stream a certain program of tracks. It’s the future but its very impersonal, and you don’t even select the music yourself. So at the end you have nothing physical in your hands, you don’t even have a file in your computer anymore. And we will be controlled even more by algorithms. With this music especially, you can see this from a somewhat different perspective, as an experiment in focusing – if you just concentrate on something very strongly for 15 minutes it’s of course different than listening to ‘some music’ in the radio or by a streaming program the whole day. I think that’s also the main idea, to concentrate for 15 minutes on those 7″ and become aware of it. Who are your clients – what kind of people are ordering the most? Well, mainly male people unfortunately, but it’s like this for the whole experimental scene (and probably also for music collectors in general), otherwise its hard to categorize. Many musicians for sure but also all kinds of people, and not only intellectuals but also customers who just run normal day-jobs. There’s a lack of younger customers for sure – my customers are mainly the same age as myself because many grew up with me. So in the future,my customers will all die and I will be very old or the other way round (laughs). Luckily there are also always new listeners and customers appearing, the main part comes from Germany and Europe, but there are customers worldwide ordering. Why do people listen to experimental music? Can we describe those people as seekers? Yes, it’s a good idea. They are the seekers of their own soul, people who are not done yet with themselves. Do you think digital distribution has doomed record labels ? A little bit of course, for all labels selling physical stuff it’s a problem since maybe 10 years. This ‘market’ is perhaps not doomed but it presents problems. You can also offer digital versions but this can’t balance out the loss. You can only try to have a good profile to release something really special and find people who want to buy it in physical format. It shouldn’t be too expensive because people think ‘I don’t buy vinyl because I have to pay €25 for one LP – its too much’. So I always thought experimental music on vinyl shouldn’t be too expensive, because if you want to find some new people it has to be affordable by everyone, not only guys with big money who put their copies into a cupboard or a museum. Which kind of concepts are behind each of your sub-labels? Drone Records as a main label started with the 7″ series – 100 releases exactly – and then I stopped this concept and went over to LPs. So now it’s like four 7″ on one LP and the series is called “Drone-Mind//Mind-Drone”. “Substantia Innominata” as a sub-label is a 10″ series I started in 2005 and it has a special concept – to work on something more abstract: The Unknown. I am very fascinated with this topic. Substantia Innominata means ‘substance with no name’; it’s also an area in the brain but they don’t know what it’s good for. So i thought it’s a nice idea, to express and explore the Unknown. Then there is a label for Troum stuff called Transgredient. There we release only CDs and music somehow related to Troum – Collaborations or full Troum CDs. Lately we released there the new Raison d’être album “Mise En Abyme”. We met Peter a few years ago on a festival and liked each other so much, and a label from Brazil (Essence) proposed to do a collaboration so we started to work on it; and we still do (laughs), for around 3 years already. I hope we will finish it this year. We got to know each other and he was looking for a label for his new album and we said ‘why not’. So it’s still somehow connected to Troum. What would you tell someone interested in starting their own label? Maybe the most important thing is that you shouldn’t have too high expectations – that you can live from this immediately or something like that. If you choose experimental music the main thing is for you to have enough idealism and to really love the music you want to release. Then I would say to everyone, ‘yes, just do it’! It can be so nice to have many interesting contacts, and just to release something is a very nice feeling, suddenly it’s in the world, it’s like giving birth to something valuable.